East Bengal are reeling under huge pressure and coach Trevor Morgan could be shown the door at the end of the league . 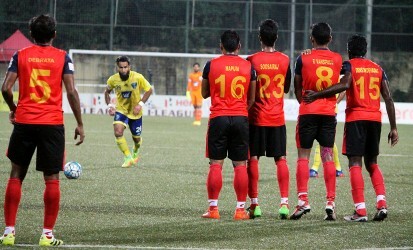 . .
A fourth straight defeat, this time at the hands of DSK Shivajians, saw Kingfisher East Bengal lose 0-1 to categorically end their title aspirations with pressure and further mounting more pressure on coach Trevor James Morgan before the final two fixtures of the Hero I-League 2016-17. Still reeling from their derby defeat at the hands of Mohun Bagan, the Red and Gold brigade paid the price for a shaky start by conceding in the 28th minute when an unmarked Jerry Mawihmingthanga turned in Spanish forward Juan Quero’s cross. The second half saw visiting goalkeeper Subrata Paul in superb form denying East Bengal a number of times to come back into the game. Kingfisher East Bengal ringed in five changes to the side that lost to Mohun Bagan 1-2 at the Kanchenjunga Stadium in Siliguri in the previous round. T.P. Rehenesh, Robert Lalthlamuana, Romeo Fernandes, Willis Plaza (suspended) and Wedson Anselme made way for Subhashish Roy Chowdhury under the woodwork, Jackichand Singh, Bikash Jairu, Chris Payne and Robin Singh in the starting XI. The visitors looked the sharper side in the opening exchanges with Jerry heading wide early on. The diminutive player was not denied much longer as Shivajians took the lead heaping further misery on East Bengal in the 29th minute. A wonderfully weighed floated cross by Juan Quero found Jerry unmarked inside the area, the midfielder heading in with ease. Paul did not allow East Bengal to level in the 33rd minute, pulling off a double save to deny Rowlin Borges and Bikash Jairu. Soon after, Robin Singh brought down the ball inside the box to backpass for Borges who curled it in only to find Payne not there to lap up the chance. Paul punched the ball out only as far as Abinash Ruidas whose snapshot hit the side-netting. At halftime, the hosts went inside the tunnel with their heads down, trailing 0-1. 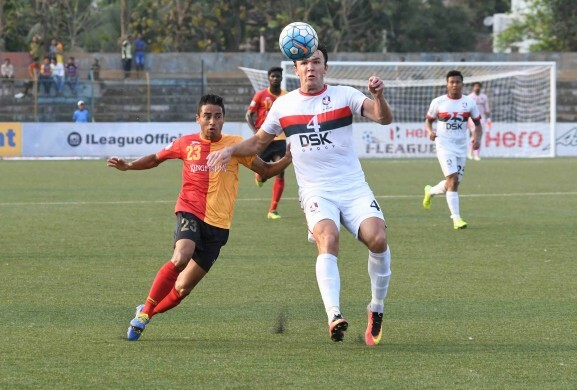 Trevor Morgan injected Wedson Anselme in place of Ruidas at the start of the second period for the elusive goal as Kingfisher East Bengal created a flurry of chances. Wedson set up Rahul Bheke whose shot as parried over by an alert Paul. Payne was at the heart of Red and Golds next move as the Aussie’s first attempt was cleared from the goalline by Bosnia and Herzegovina defender Sasa Kolunija and then Paul latched onto the second try. Subhashish halted Shivajians from extending their lead soon after, holding on to a Jerry header after the teenager combined well with Seityasen Singh. Romeo Fernandes came in place of Jairu as Morgan went for the kill with time running out. Wedson saw his low drive saved acrobatically as well by Paul as the hosts swallowed the bitter pill at the end of ninety minutes. With the defeat, Kingfisher East Bengal’s title aspiration practically fades away as Mohun Bagan (33) and Aizawl FC (33) are already six points clear of them with two matches in hand.